Objectives To evaluate and compare the characteristics of court verdicts on medical errors allegedly harming patients in Spain and Massachusetts from 2002 to 2012. Design, setting and participants We reviewed 1041 closed court verdicts obtained from data on litigation in the Thomson Reuters Aranzadi Westlaw databases in Spain (Europe), and 370 closed court verdicts obtained from the Controlled Risk and Risk Management Foundation of Harvard Medical Institutions (CRICO/RMF) in Massachusetts (USA). We included closed court verdicts on medical errors. The definition of medical errors was based on that of the Institute of Medicine (USA). We excluded any agreements between parties before a judgement. Results Medical errors were involved in 25.9% of court verdicts in Spain and in 74% of those in Massachusetts. The most frequent cause of medical errors was a diagnosis-related problem (25.1%; 95% CI 20.7% to 31.1% in Spain; 35%; 95% CI 29.4% to 40.7% in Massachusetts). 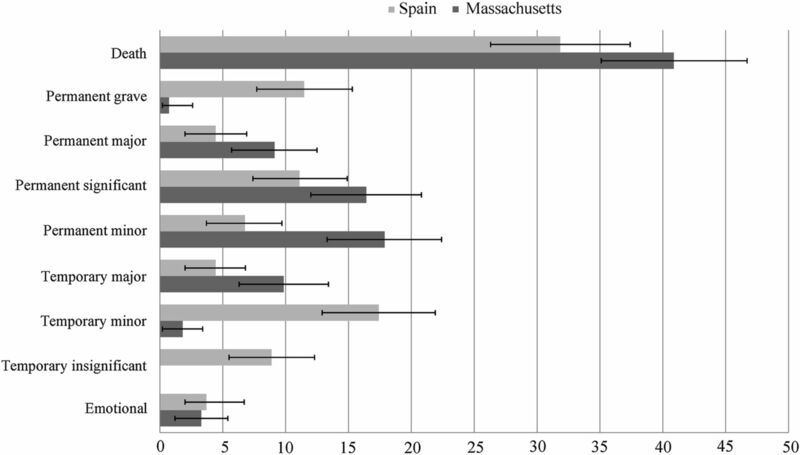 The proportion of medical errors classified as high severity was 34% higher in Spain than in Massachusetts (p=0.001). The most frequent factors contributing to medical errors in Spain were surgical and medical treatment (p=0.001). In Spain, 98.5% of medical errors resulted in compensation awards compared with only 6.9% in Massachusetts. Conclusions This study reveals wide differences in litigation rates and the award of indemnity payments in Spain and Massachusetts; however, common features of both locations are the high rates of diagnosis-related problems and the long time interval until resolution. Patient safety has been developed from several perspectives: health, economic, ethics and legal issues. However, there is wide variation in how different countries implement patient safety policies in healthcare, and how the legal system is involved in the patient safety setting. This is the first study that evaluates and compares the relationship between court verdicts in different healthcare and judicial systems involving medical errors. In both locations, only a small proportion of court verdicts involved injury-producing medical errors. The probability of receiving economic compensation for a medical error adjudicated in court was markedly higher in Spain than in Massachusetts, and the number of providers involved in Massachusetts was higher than in Spain. The main limitation of our study is the research of the outcomes of closed verdicts in court involving injury-producing medical errors. Therefore, we did not investigate any agreements or settlements. The aim of this study was to assess and compare the characteristics and outcomes of medical errors leading to lawsuits being resolved in courts in Spain (no fault system) and Massachusetts (civil court) between 2002 and 2012. To obtain data on litigation in Spain, we used the Thomson Reuters Aranzadi Westlaw databases, which provide records on all closed claims adjudicated in court nationwide. Hence, these data provide information on lawsuits resolved in a courtroom setting by ‘no fault system’. This database includes 1041 closed verdicts involving the health system between 2002 and 2012. For Massachusetts, data were obtained from the Controlled Risk Insurance Company and Risk Management Foundation of the Harvard Medical Institutions (CRICO/RMF) in Cambridge (Massachusetts, USA). CRICO/RMF represents the largest medical professional liability carrier in Massachusetts and provides industry-leading medical professional liability coverage, claims management and patient safety resources to the Harvard medical community. We identified 370 closed verdicts in this database involving the health system by the civil court. Verdicts were reviewed by one researcher, first to identify those that could have involved a medical error and second to determine whether a medical error had occurred. If so, the researcher analysed the characteristics and outcomes of the error. The following variables were collected: number and date of the court verdict, date of medical injury, number of plaintiffs and defendants (no data on demographic characteristics were available), characteristics of the medical error and the compensation awarded by the court. The Clinical Coding of Risk Management Foundation of Harvard Medical Institutions in Cambridge (Massachusetts, USA) was used, which includes information on injury severity and contributory factors. A severity rating scale of the outcomes of the alleged injury was derived from the National Association of Insurance Commissioners, which contains a scale from 0 to 9. The contributory factors represented the reason for the injury and were coded by using three categories (low, medium and high) and nine subcategories (emotional, temporary insignificant, temporary minor, temporary major, permanent minor, permanent significant, permanent major, permanent grave and death). For the present study, we excluded verdicts on injuries occurring in prisons, work-related accidents in health centres and failures of the informed consent process, and we did not include any agreements between parties before a judgement. A descriptive analysis of the medical errors identified was conducted, stratified by severity, the main causes and the locations studied. The prevalence and percentages of court verdicts on injury-producing medical errors in Spain and Massachusetts, as well as their 95% CIs, were calculated. Prevalence and percentages were compared with the χ2 test. We also calculated the percentage ratio and 95% CI by location (Spain vs Massachusetts) of high-severity medical errors according to cause. All statistical analyses were performed using SPSS Statistics Software V.18. Closed court verdicts involving medical errors represented 25.9% of 1041 closed court verdicts in Spain versus 75% of 370 closed court verdicts in Massachusetts. As shown in table 1, the severity and contributory factors differed significantly between the two locations, although most medical errors were rated as medium or high severity (87.4% in Spain and 96.8% in Massachusetts). The most frequent cause was a diagnosis-related problem (25.1%; 95% CI 20.7% to 37.1% in Spain and 35%; 95% CI 29.4% to 40.7% in Massachusetts). The number of medical errors associated with surgical and medical treatment was higher in Spain than in Massachusetts. As shown in table 2, the percentage of medical errors rated as high severity differed significantly in the two locations (54.4% in Spain and 82.2% in Massachusetts; percentage ratio: 0.66; 95% CI 0.43 to 0.96). In Spain, the percentage of medical errors due to diagnosis-related problems (failure, delay or mistaken diagnosis) that were rated as high severity was 34% lower than in Massachusetts. For other causes, the percentage of high-severity medical errors was 15% lower in Spain than in Massachusetts, but this difference was not statistically significant. The distribution of medical errors rated as high severity in the remaining causes was similar between the two locations (all percentage ratios were near unity). As shown in figure 1, a high percentage of medical errors had a fatal outcome in both locations (31.8% in Spain and 40.8% in Massachusetts, p<0.001). There were statistically significant differences (p<0.05) according to permanent grave adverse outcome (11.4% vs 0.7%), temporary minor adverse outcome (17.4% vs 1.8%) and temporary insignificant adverse outcomes (8.8% vs 0%) in Spain versus Massachusetts, respectively. Temporary minor and permanent minor adverse outcomes were rated as medium severity, but their consequences are starkly different: a temporary minor severity adverse outcome is equivalent to an infection, fracture or delayed recovery, whereas a permanent minor severity adverse outcome means loss or damage to organs. Percentage of medical errors resolved by court. Surgical treatment was associated with 56.6% of medical errors in Spain and with 53.3% in Massachusetts. Improper management of surgical patients was associated with 30% and 33.3% of medical errors, respectively. In Spain, improper management of pregnancy was associated with 55.8% of medical errors, and improper performance of operative delivery with 32.5% of medical errors (p=0.550). In Massachusetts, the main cause of obstetrics-related problems was delay in the treatment of fetal distress (43.7%). Economic compensation was awarded in 98.5% of court verdicts involving the health system in Spain but in only 6.9% of verdicts in Massachusetts (p<0.001). In Massachusetts, 93.1% of court verdicts on medical errors awarded no compensation. In addition, 24.1% of medical errors rated as high severity in Spain led to payments of <€50 000; of these, payments of >€200 000 were awarded in 23.1%. As shown in table 3, the mean time interval between the occurrence of the medical error and the final verdict was 7.90 years (SD 3.39; range 1.62–21.7) in Spain and 7.21 years (SD 2.17; range 2.74–19.31) in Massachusetts (p=0.005). The number of plaintiffs (patients or their families) filing a claim for a medical error adjudicated at court was 368 in Spain and 274 in Massachusetts. The number of defendants involved in a medical error adjudicated at court (providers or health institutions) was 276 (mean 1.02) in Spain and was 621 (mean 2.27) in Massachusetts. To the best of our knowledge, this is the first study that compares court verdicts involving medical errors in two different locations. Over an 11-year period, most court verdicts involving the health system were related to medical errors in Massachusetts. In Spain, the proportion was lower, representing one-fourth of court verdicts involving the health system. These findings support those of other studies investigating the relationship between claims and medical errors in the USA. For example, one of the first studies showed that 28% of 46 closed malpractice claims over a 1-year period involved an adverse event.1 A study performed at Harvard on medical malpractice suggested that nearly 40% of claims were not associated with medical errors and only 15% of all claims were resolved by court verdicts.1 ,4 Both these studies evaluated the medical malpractice system in the USA, but did not compare medical errors litigated in distinctly different healthcare and judicial systems such as Spain and Massachusetts. The probability of receiving economic compensation for a medical error adjudicated in court is markedly higher in Spain than in Massachusetts (98.5% vs 6.9%, respectively). However, unequal compensation was awarded in Spain for events with the same degree of injury. These economic data only reflect compensation awarded by court verdicts and not disputes over medical errors resolved through settlements, mediation or arbitration. Moreover, a study in the USA showed that a substantial minority of physicians were not required to make an indemnity payment after a claim, probably because patients would have difficulty finding an attorney in the tort system because the expected award would not justify his or her investment in the litigation.2 Reforms are therefore needed in the system such that healthcare organisations provide compensation that is fair to equally harmed patients, and a deep sense of individual and institutional accountability for safety, with an emphasis on fairness as providers and patients alike. Our study has several limitations. First, we used different databases to collect information on closed court verdicts. In Spain, we used a nationwide database that provides closed court verdicts from a ‘no fault system’, whereas in Massachusetts we used a database from an insurance company that represents a large proportion of all institutional healthcare in Massachusetts and which shows closed court verdicts from civil court. Second, our study investigated the outcomes of closed verdicts in court involving injury-producing medical errors. Therefore, we investigated only a small number of medical errors occurring in the healthcare setting, and even lesser than studies evaluating the outcome of medical errors resolved by agreement or settlement. Third, we evaluated the occurrence of medical errors in two health systems and legal-justice setting with vast differences. Therefore, we used different variables related to effective of both settings, as related to health system (occurrence, main causes, factors contributing, severity) as variables related to legal-justice setting (time interval between medical error and the verdict, numbers of plaintiff and defendants involved or the economic compensation awarded). Fourth, the closed courts verdicts were reviewed by a single researcher, which may have introduced bias in the selection of the files. Fifth, in both locations, patients may have different reasons for filing a claim for possible medical errors occurring during their care. On the other hand, in both locations, the lawsuits resulting in the court verdicts reviewed were filed based on the litigants' expectation of receiving economic compensation. However, given the time interval between filing a claim and the award of compensation, as well as the variability in the amounts awarded, other methods of dispute resolution such as arbitration and mediation should be encouraged. In conclusion, our estimates provide a glimpse into medical errors leading to litigation in different locations. The information gathered on the low rate of medical errors leading to court files, the high number of diagnosis-related problems, variability in indemnity payments and the time required for resolution could be used to design new approaches to instigate change. The authors would like to acknowledge Dr Allen Kachalia for his commentaries of this manuscript and the staff of the Risk Management Foundation of the Harvard Medical Institutions, especially Ann Doherty and Kyle Bergquist, for the knowledge and support that they contributed to this project research.
. Policy research perspectives-medical liability claim frequency: a 2007–2008 snapshot of physicians. Chicago: American Medical Association, 2010.
. Nurturing a culture of patient safety and achieving lower malpractice risk trough disclosure: lessons learned and future directions. Front Health Service Manage 2012;28:13–28.
. Administrative compensation for medical injuries: lessons from three foreign systems. Issue Brief (Commonw Fund) 2011;14:1–18.
. The incidence and nature of in-hospital adverse events: a systematic review. Qual Saf Health Care 2008;17:216–23.
. Disclosing adverse events to patients. Jt Comm J Qual Patient Saf 2005;31:5–12.
. To err is human: building a safer health system. Washington DC: National Academies Press, 1999.
. The Canadian Adverse Events Study: the incidence of adverse events among hospital patients in Canada. CMAJ 2004;170:1678–86.
. Tort reform. While some states have taken action to cap damages, fear of litigation still drives defensive medicine. Med Econ 2013;90:20–2, 24–6.
. The economic consequences of medical injuries. Implications for a no-fault insurance plan. JAMA 1992;267:2487–92. Contributors PG and XC conceived the study. LS, JMM-S, MC, MS, KD, XC and PG contributed to the design and coordination of the study. PG analysed the data. PG, LS and JMM-S drafted the first manuscript. All authors contributed substantially to the interpretation of the data and successive revisions of the manuscript. All authors contributed to the manuscript and approved the final version. PG is the principal researcher for the project. Funding This project was funded by the Ignacio Larramendi Research Grants 2013 MAPFRE-Foundation, for which PG is the principal researcher. This research was supported by Grants from Instituto de Salud Carlos III FEDER (RD13/0001/0013). Ethics approval The protocol of this study was approved by the Ethics Committee of the Hospital Mar Medical Research Institute from Barcelona (Spain).